Located in Terres Basses, Joie de Vivre is one of St. Martin’s finest homes. It sits on over 4 acres and comes with direct access to the beach via a private path, and privacy is virtually guaranteed here. The home itself is a unique 3-level design that is best suited for couples, groups of friends, or families with older children. There are 3 bedrooms and 3.5 bathrooms, a huge kitchen, living area, and a patio overlooking the ocean and tropical plants. The villa’s pool is one of the largest on the island, and there are lots of comfortable chaises surrounding it for sunbathing and relaxing. This great villa, situated on a 4.4-acre beachfront plot, not only has direct access to Baie Rouge Beach, but also enjoys good views of the coastline and the island of Anguilla. 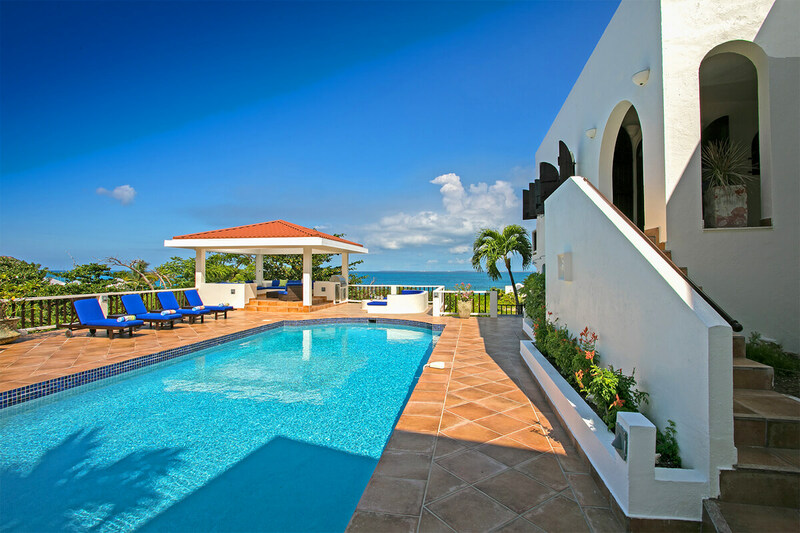 Built on 3 levels, Joie De Vivre has 3 spacious bedrooms and 3 baths, an outside living area giving views over Baie Rouge, and a large swimming pool and gazebo. Bedrooms all have king-size beds, air-conditioning, DVD, ceiling fans, and TV. Joie de Vivre has a housekeeper and caretaker that live in the gate house just far enough away to insure maximum privacy, but close enough to assist the renter should the need arise. There is a large gazebo at one end of the pool (one of the largest private pools on the island) that is perfect for enjoying an afternoon cocktail. Down from the patio and pool area, a staircase leads to a short private path to Baie Rouge Beach, one of St. Martin’s finest. With an open floor plan, whether you are in the fully equipped kitchen, dining area, or the living room, you have a view of the water as well as the British Island of Anquilla. The entire villa has been comfortably furnished and every modern convenience has been thought of, including satellite TV, sound system throughout, separate phone and fax lines, and an intercom to the housekeeper’s cottage and privacy gate. Joie de Vivre is an ideal location for a memorable Caribbean vacation. The home is not recommended for small children. Caretakers with dogs live on the property in a separate cottage. Washer & dryer are not available for use by renters. The housekeeper will do your personal laundry for a small fee. Bedrooms #2 & #3 are accessed via the exterior only and do not enter into the main living area. Satellite TVs in all bedrooms. Free phone calls to US, Puerto Rico, and Canada. Kennel on-site. A minute's walk to beautiful Baie Rouge Beach where there is excellent snorkeling. The nearest beach besides Baie Rouge, is Plum Bay which is a 5 minute drive from the villa. There is good snorkeling at this beach as well. Welcome, but no children under 12. Not suitable for the elderly or handicapped as villa is on 3 levels. Good for stays from Apr 15, 2019 to Dec 16, 2019.